Iconic Los Angeles artist Ed Ruscha photographed iconic Los Angeles streets beginning in the 1960s. By mounting a camera to a moving car, Ruscha documented sequential storefronts on the north side of Hollywood Boulevard between McCadden Place and Hudson Avenue, and on the south side of the street between Wilcox Avenue and McCadden Place. 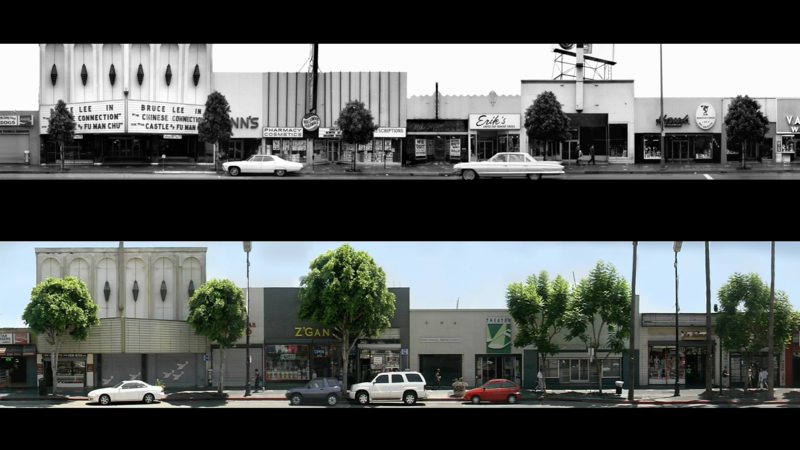 The images in the top black and white “filmstrip” show what the Boulevard looked like in 1973, and the bottom one in color documents the same locations in 2002. The building that LACE has occupied since 1994 at 6522 Hollywood Boulevard on the south side appears in this work. LACE was founded in Downtown Los Angeles at 240 S. Broadway and then moved to 1804 Industrial Street before its long-time tenure on Hollywood Blvd. The organization celebrates its 40th Anniversary as the longest-running contemporary artists space in Los Angeles. LACE has been located on Hollywood Boulevard for 24 years and is exhibiting this artwork in its window on Hollywood Boulevard 24 hours a day through the end of 2018. Thanks to Ed Ruscha, and our friends at the Ed Ruscha studio and the Getty Research Institute for this loan. This video is part of Pacific Standard Time Presents: Modern Architecture in L.A., a Getty initiative that brings together local cultural institutions for a wide-ranging look at the postwar built environment of Los Angeles, from its famous residential architecture to its vast freeway network, revealing the city’s development and ongoing global impact in new ways. Video: Edward Ruscha Streets of Los Angeles Archive, Getty Research Institute, © Ed Ruscha.